Do you know how your brain reacts in a live concert? 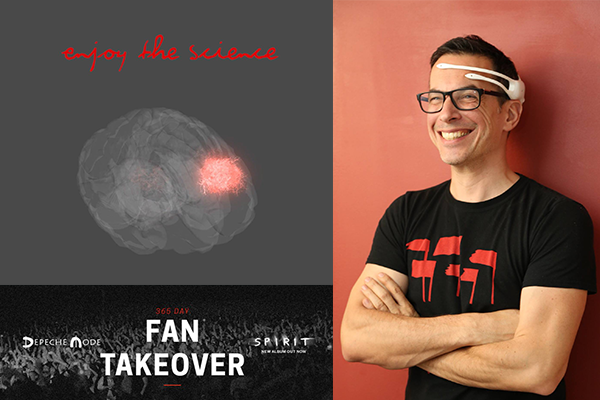 Professor Olivier Oullier and his longtime friend and fellow Depeche Mode fan, Tobal were recently invited to attend their concert in Paris to record their own brain activity over the course of the entire performance. The project, called “Enjoy the Science” aims at uncovering what happens to your brain at a live music event. Brain activity as well as heart rate were monitored to better understand which songs were preferred. The band’s hits generated higher levels of attention and excitement, but not as high as during two surprise numbers. Whilst being a fun passion project for our President, this experience also provided great insight into the brain and shows how significant music and unique experiences are to the individual. As part of the invitation from the band, Olivier was also given the opportunity to take over as editor-in-chief for a day on the Depeche Mode Facebook page to show highlights of his experience. Watch the video above to see more!